It's Facebook Fridays! for May 22, 2015, and we want to HAND you some really good LUCK! The Lucky Mojo Curio Co. is hosting a random drawing to give away 5 "gambler approved" Lucky Hand Spiritual Supply prizes. 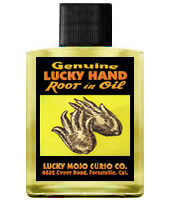 This week the prizes are five bottles of Lucky Hand Dressing Oil, along with 5 small Lucky Hand Roots, and five traditional Red Flannel Bags. First thing tomorrow morning, we will select [number written out as a word, IN CAPS] winners at random, announce their names here, and ask them to message this Facebook Page with their mailing addresses, so we can send them their FREE [Product Line] products. We have a winner! In fact, we have 5 lucky winners! Our Facebook Fridays! winners for May 22, 2015 are: Moira McCash Schuhart, Thomas Michael Caldwell, Langston Kahn, Ramona Brush, and Robert Wilhelm.